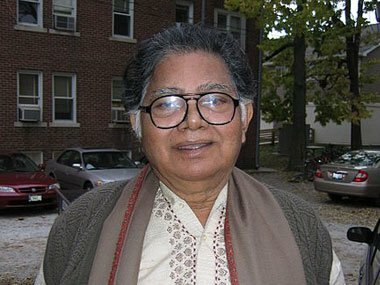 Bengali poet and novelist Sunil Gangopadhyay has died in the Indian city of Calcutta aged 78. Sunil Gangopadhyay died early on Tuesday morning following a heart attack, reports said. His body will be kept in a mortuary till his son arrives from the US for his cremation, his family said. Sunil Gangopadhyay wrote more than 200 books and was awarded several prestigious awards, including the Sahitya Akademi Award and the Hindu Literary Prize. One of India’s most popular contemporary authors, Sunil Gangopadhyay wrote novels, short stories, travelogues and children’s fiction, but always said that poetry was his “first love”. He was the founder editor of Krittibas – a poetry magazine that encouraged new poets experimenting with new forms. “One of Bengal’s brightest literary stars has been extinguished. This loss will be extremely difficult to overcome. Sunil Gangopadhyay was one of the greatest Bengali intellectuals,” India’s President Pranab Mukherjee said in his tribute. Many of his friends and fans have also been paying tribute to the author. “Deeply shocked by the death of the great Bengali writer Sunil Gangopadhyay. He was warm, kind man and a dear friend. Will miss him terribly,” well-known author Amitav Ghosh wrote on the micro-blogging site Twitter. “It will be extremely difficult to fill the vacuum in Bengali literature after his death as Sunil had heralded a new style in Bengali literature,” PTI quoted eminent Bengali writer Shirshendu Mukhopadhyay as saying. “Bengali literature has lost its guardian,” said fellow writer Samaresh Majumdar.